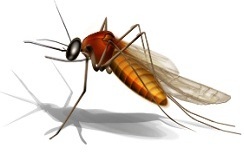 Mosquito Control Doesn't Have to be Dangerous. 3. Spray to kill adult mosquitoes with "essential oil" plant oil pesticides such as Avenger Natural Insect Control or EcoSMART. Garlic oil sprays work well to repel the insects for up to 20 days. Even better, broadcast dry garlic to the site at 1 - 2 pounds per 1000 square feet. Dr. T’s Mosquito Repellent is another good dry product but Bonide Mosquito Beater Granules are more cost effective and work better. Ask for products in your Independent Garden Center. You can also read and learn more in my new book Organic Manual for the Professional.